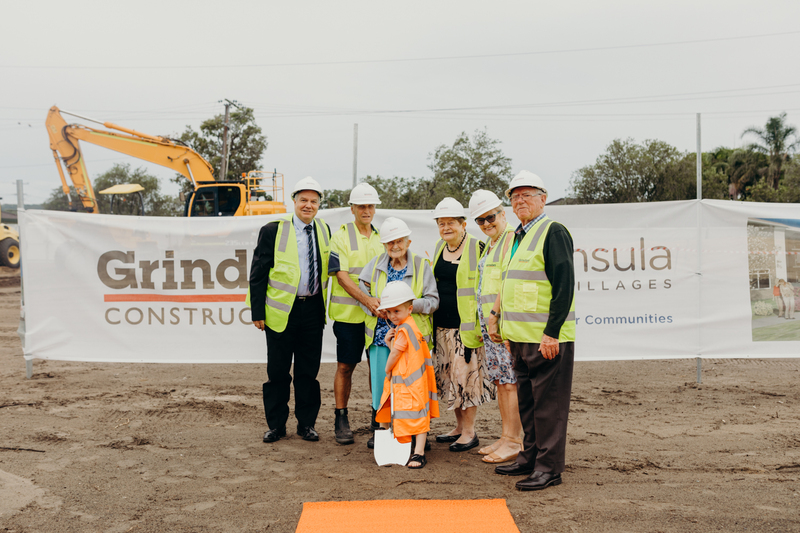 Peninsula Villages has now launched its state-of-the-art 114-bed ageing in place facility at Umina Beach with a special ground-breaking ceremony marking the commencement of the new three-storey building. With construction commencing by Grindley builders, the ground-breaking ceremony on Monday 25 March was attended by representatives from local schools, community groups and partner organisations including the Umina Kids Klub, special guests from Peninsula Villages as well as Federal Member for Robertson Mrs Lucy Wicks and Deputy Mayor Mr Chris Holstein. Confirming Peninsula Villages reputation as a local leader in residential aged care, the approximately $30 million development will offer a standard of service not seen before on the Central Coast. The distinguishing features of the new aged care development will include specialist aged, palliative and dementia care units all to be housed within separate hubs and accommodated on separate floors to ensure continuity of care between care staff and the residents. Surrounded by vibrant gardens and opening onto a generous entrance bay for vehicles, the new building will replace the existing amenities at Jack Aldous House. Chief Executive Officer of Peninsula Villages, Shane Neaves, said anticipation among residents and staff alike had been rising fast as construction approached. “Peninsula Villages has served the Central Coast community for over 40 years – and this ground-breaking ceremony is one of the most exciting moments in our history,” said Shane. “This new building is the product of a fantastic vision from our Board of Directors, our planners, hard work ahead for our builders, and, very importantly, support from the local community and authorities, which we appreciate greatly. Not only will this building be a huge boost for our premises, but also for the local economy and labour market, creating more jobs,” he added. All 114 rooms will be private suites with a bathroom. Within each level, the rooms will also be split into distinct units, each boasting key staff to ensure an uncompromising level of dedicated care. Chair of Peninsula Villages Jan-Maree Tweedie said the development would keep the Umina site at the industry’s forefront for decades to come. “With an ageing population comes greater demand for not just aged care services, but services of a level we would all aspire to,” Ms Tweedie said. “The traditional focus on patient treatment and care remains, but with even more attention to comfort and enjoyment, and of course with the best standards upheld to allow our residents to have consumer directed care that is about meeting their needs as they change,” she added. The new 114-bed ageing in place building at Peninsula Villages is expected to be completed by late 2020. Image caption (from left to right) - Peninsula Villages CEO Shane Neaves, longest serving employee Greg Smith, oldest resident 102 year old Biddy Abrahams, Life Member & Honorary Director Pam Palmer, Peninsula Villages Chair Jan-Maree Tweedie, Life Member Burt Jordan and Umina Kids Klub representative Cooper Gibson.